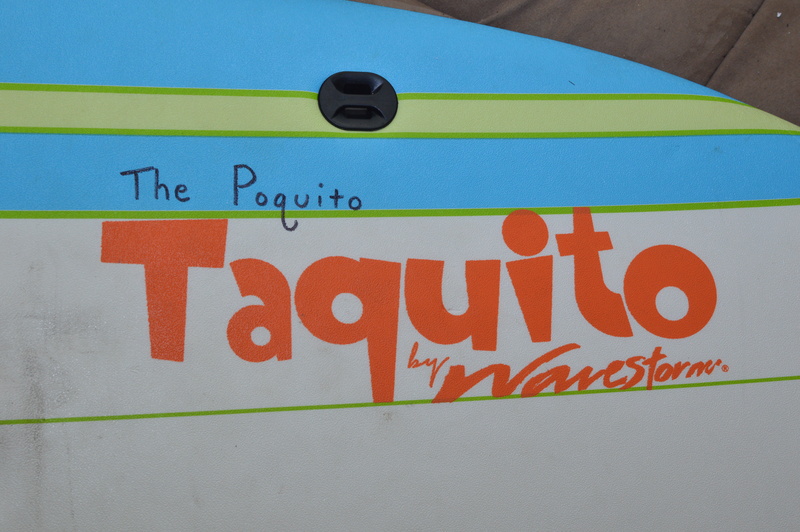 My Poquito Taquito project – a short version of the Wavestorm Taquito kid’s paddleboard – has been a pretty great success so far as a low-water board. So far it’s done well on low to medium flows at Dave’s Wave, Beaver Wave, and Chiclets at River Run Park. The shorter length and thruster setup allows for a sportier feel and quicker turns when surfing low river waves, but the extra float (nearly double the thickness of most short, soft surfboards) allows for popups on slower, mushier waves where the planing surface alone doesn’t provide for enough stability/speed – you need some help from the flotation of the board itself. It’s also proved to be pretty durable, though the marine sealant on the tail has started to wear. I recently heat-sealed duct tape along the rails – they had started to separate a bit, and while Gorilla Glue helped, it seemed like I needed a more permanent solution. I basically used the duct tape welding technique that I’ve had good luck repairing whitewater kayaks with; we’ll see how it holds up. So far, I haven’t found a board I like more for low-flow fall and winter waves in the Denver area.